Coconut oil is an amazing natural treatment for beautiful hair! It’s rich in vitamins and fatty acids that nourish the hair, can promote growth, and more. Coconut oil is widely known as a cure-all for everything these days! 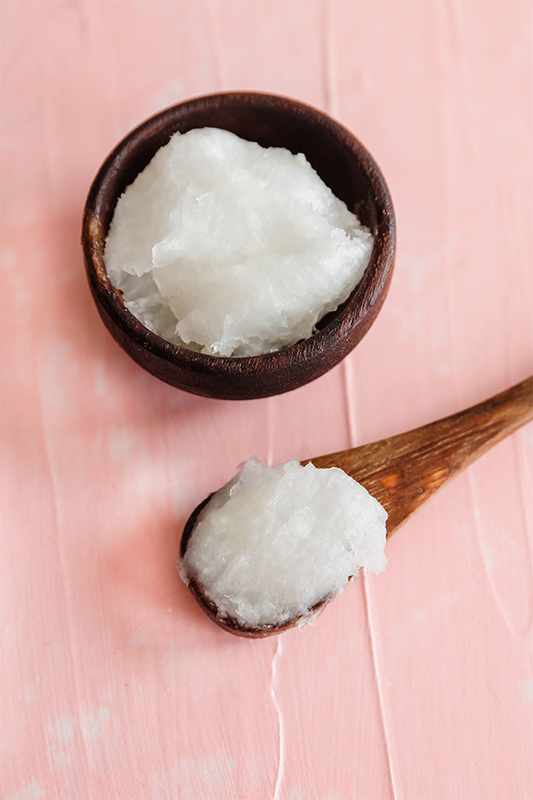 From topical treatments like moisturizing your skin to internal uses like oil pulling, cooking at high heat and in baked goods, and using coconut oil for strong beautiful hair, coconut oil can basically do anything. As someone with Hashimoto’s disease who has suffered hair loss and damaged hair from the autoimmune thyroid disease, I’ve tried my fair share of natural hair masks, rinses, and treatments to regain strong hair. Though an overall healthy diet and lifestyle have helped tremendously with healing my health and hair, coconut oil is another amazing strategy for beautiful hair, with so many benefits and uses! First, does coconut oil work for everyone? There is a myriad of different hair types and not all of them will work well with coconut oil treatments. It’s always best to listen to your own body and go slow with any new treatment. Go slow, and use small amounts at a time to test how your hair tolerates it. A great complimentary treatment to using coconut oil would be an apple cider vinegar hair rinse, as it will help remove excess build up if you find coconut oil to be too much for your hair! And of course, if you have an allergy to coconut you’ll want to refrain from using any of these treatments. Coconut oil is a healthy fat that is very moisturizing to the skin, and hair, and as well as a great cooking fat. Coconut oil can fight harmful microorganisms which are particularly helpful for the skin, or hair and scalp, and even the balance of our gut bacteria when ingested. Because it’s rich in fatty acids, coconut oil provides valuable nutrients when used topically or internally. A 2014 study where rats were fed different varieties of oils had shown coconut oil to be the most anti-inflammatory! It’s rich in antioxidants which reduces inflammation in the body when ingested and can calm inflammation on the skin and the hair. Coconut oil can help hair growth, deep conditioning, sun protection, and can eliminate dandruff and lice! Scoop about 1 tbsp of coconut oil at a time into to your hands, and rub the oil together to melt if solid. Work the coconut oil into your roots to stimulate growth, and towards the base of your hair to nourish. Use about 4-5 tbsp of coconut total or as much as is needed to coat your hair well. Use a shower cap, towel, or a secure hairpin to put up your hair. Keep in mind a hair tie will absorb the oil. Leave the coconut oil overnight, or for 3-4 hours to allow to set. Shampoo and condition your hair well (potentially using an apple cider vinegar rinse to remove excess oil if necessary) and dry. Repeat 1-2x weekly to nourish the hair. It’s important to remember that topical treatments like coconut oil can potentially help, but getting to the root cause of what is really causing the hair growth is always the most effective strategy for halting hair loss. Coconut oil has been proven in this 2003 study to nourish damaged hair better than other oils. It leaves your hair beautiful, soft and shiny, and is great for nourishing and moisturizing hair that’s damaged, or just needs a little extra love. Follow the instructions above or watch the video below to deep condition your hair about once a week, or more or less depending on how much your hair needs the conditioning. Rub 1-2 tbsp of coconut oil in your hands until melted. Work the coconut oil into the ends of your hair, focusing on any tangles. Carefully use your fingers to run your hands through the tangles to loosen them. Brush your hair and enjoy tangle free hair! Use a dry shampoo to remove any excess oil to go about your day, or wash your hair well to remove excess oil. If you’ve ever had dandruff, you’ll know that it’s very inconvenient and very annoying! I started struggling with dandruff in my early teens and was desperate for relief. Dandruff can be triggered by hormonal imbalance, inclement weather, products that don’t work well for your hair, and more. To use coconut oil for dandruff reduction, use a tablespoon of melted coconut oil on your hair once a week, focusing on your scalp to help reduce dandruff and nourish the scalp. Though getting a good amount of Vitamin D is perfectly healthy, it can be too much a good thing. We’re used to using sunscreen on our skin and sometimes may use a hat to protect our scalp. However, our hair is also prone to sun damage. If you plan to spend time in direct sunlight, use a very small amount of melted coconut oil as a leave-in condition to protect your hair from sun damage. Lice are incredibly inconvenient, and coconut oil has been shown to help eliminate lice. Though other treatments may be more effective in killing lice in one blow, they’re also more toxic and pose more risk for inflammation and exposure to harmful chemicals. Wash your hair with warm water and allow it to dry to where it’s damp. Massage several tablespoons of melted coconut oil into your hair, focusing mostly on the scalp and the roots. Place a shower cap on your head and allow to set for 8 hours or overnight. Use a fine tooth comb to remove any dead lice from your hair. Repeat if necessary, using an apple cider vinegar rinse between treatments. I hope you love and use these easy DIY treatments! What’s your favorite way to use coconut oil? I haven’t talked much about my skin here on the blog. Mostly because there are still so many other things to focus on (gut issues, hashimoto’s, heavy metals, chicken poppers, you know…) but also because I still don’t have it figured out. Part of me wanted to hold back because I didn’t have all of the answers, but here’s the thing… I’ll never have all of the answers. I’ve struggled with my skin and acne since I was 10 years old, and though I don’t have it all figured out, I wanted to use my platform to share encouragement, and what’s working for me. Skin problems are really hard. It’s so hard to get to the bottom of, and pretty impossible to completely ignore. Our skin is one of the last things to heal in our body, so it takes tons of time to effectively heal it. I am titling this blog post “How I’m Healing” rather than “How I Healed”, because I’m still not there. However, I have made a fair amount of change as of late I wanted to share. On the left, you’ll see a particularly bad flare from summer 2017. I was stressed, I was eating too much sugar, and I was trying tons of skincare that was only making my skin worse. It didn’t look like this every day… but it did look like this many times throughout my life. On the right, you’ll see my skin now, in March 2018. You had to know that I was bring it back to the gut, right? Our body is made up of what we eat, and if we have an unhealthy diet and an unhealthy gut, that is directly reflected in our skin. Common foods that cause acne and skin issues more than others are dairy, gluten, poor quality fats, and sugar… just to name a few. 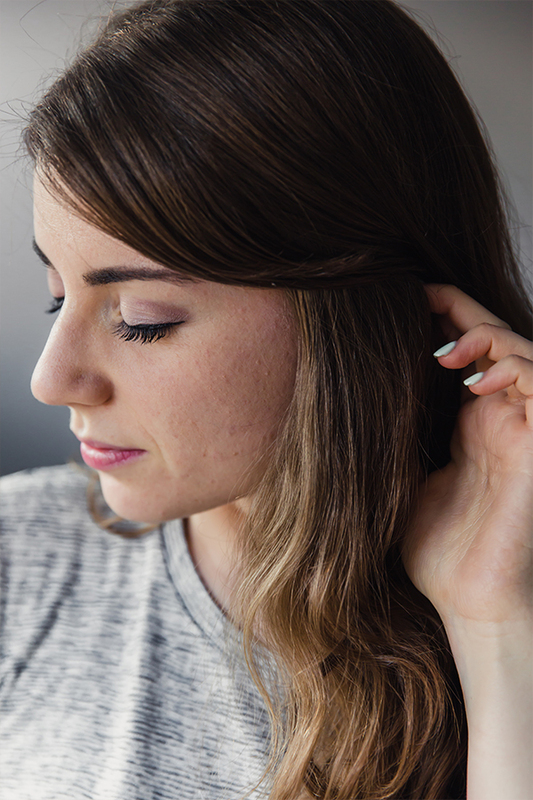 Hormonal shifts are one of the most common causes of adult acne. It can cause the pores to get larger, excess oil production, clogged skin, and overall inflammation. Stress is related to all of the above and more. Stress of all kinds (emotional, mental, physical) throws off everything in the body and can easily cause excess acne. How we care for our skin is so important! Not washing off your make up, or neglecting strategies to clean up clogged pores and control excess oil can really be counter productive. My acne started at about 10-11 years old. That’s almost 17 year that I’ve struggled. I hit puberty fairly early, and my skin flared immediately. I always had acne on my forehead, and it slowly started to migrate down to my cheeks, nose, and eventually my chin. I tried everything from Proactive, to prescription acne pills, to prescription creams, to just doing nothing at all. No matter what I did, it would still come back. Even now as an adult who eats a good diet, I still struggle from time to time. It’s isolating, it’s physically painful, and it can really kill your confidence. Clearly, there is so much more to confidence and self worth than your physical appearance. However, inflammation on the outside is a reflection that something isn’t right on the inside… and more than anything, that bothered me so much. If you read my blog regularly and follow me on social media, you’ll know that I eat a mostly Paleo and AIP template to keep myself feeling great with Hashimoto’s. Diet is the first step and so necessary for a health body inside and out. This is a new development that I was denying for the longest time, but knew was necessary. I was correlating excess sugar with more acne… there was no question about it. I went though a Whole30 in February/ March and noticed a huge difference in my hormonal breakouts. It was one of my first cycles in years that I hadn’t broken out! When I say excess sugar, I mean things like refined sugar, maple syrup, honey, and excess fruit and starchy carbs. I still eat sweet potato here and there, and enjoy fruit in moderation. Everyone is different here and it takes a lot of work to find your sugar threshold, but I’m still learning! This is an area that I’m still working on with my doctor. I have dealt with estrogen dominance and low progesterone and am slowly working to bring it back into balance. I haven’t retested my levels recently, but I’ve felt improvements for sure. You can read about what I’ve done here. This is probably my weakest point. Guys… I’m a workaholic. I loveeeeeee what I do, but I can do too much sometimes. I have to force myself to shut off and step away from work or I will truly work 7 days a week, until 10 PM. I grew up in a family where this was the norm, and I fully admit that I am harming myself when I do this. However, it is so crucial to having a healthy mind and body. I hired a contractor to help with some Unbound Wellness work! Well, a podcast editor, but it saves me so much stress!! Our editor rocks. I pray outloud. Conversations with God help so much. 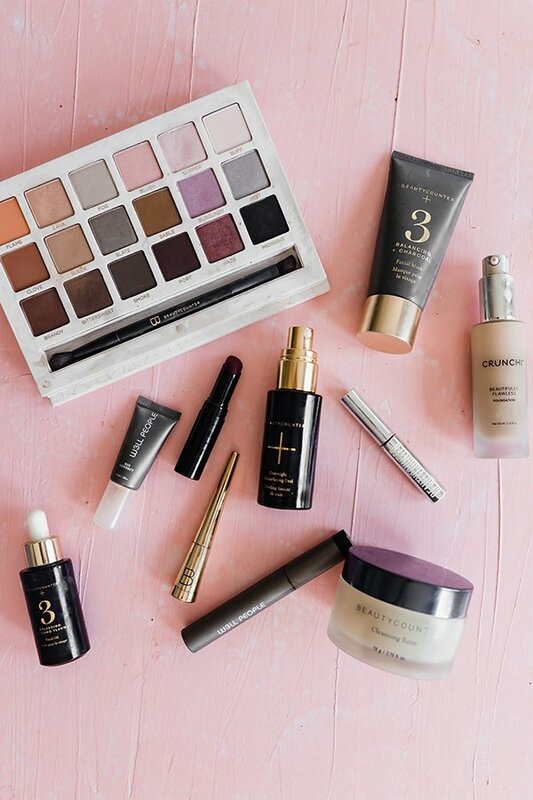 I’ll admit it… I’ve never been great about skincare. The problem is that so many products only made me worse! My skin was better off sometimes without cleansers and oil control solutions from the drug store that just made me break out more. Cleansing oil from primally pure. I use this every morning and it really starts my day off on the right foot! It controls the amount of oil on my face and leaves it feeling soft and clean. 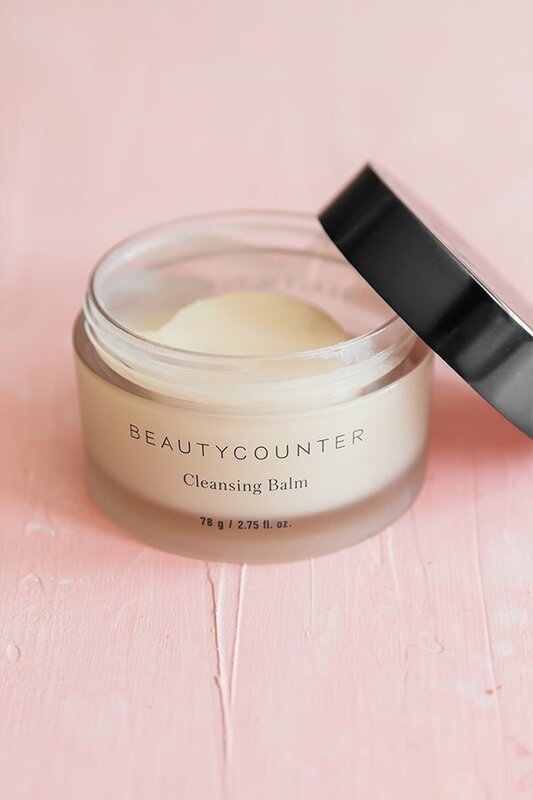 At night I use the BeautyCounter cleansing balm that also helps remove makeup, but I love both of these so much! BeautyCounter Charcoal Mask. I’ve been using this mask for years, and it really helps! I’ve gotten more serious about using it 1-2x a week, and I’m seeing the difference. Charcoal helps remove impurities and this mask is also great for spot treatment. When I have acne inevitably pop up, I use this as an over night treatment and it calms down even my most stubborn spots. BeautyCounter Toner Pads. These are everything that I wanted proactive to be when I was 15. These toner pads help supply antioxidants, and control acne. I use them twice a day and cut them in half it get more bang for my buck! BeautyCounter Balancing Facial Oil. This stuff is a game changer. It’s not cheap, but it’s worth it. It’s amazing for oily skin and moisturizes without adding excess oil. It’s made for those struggling with balancing their skin, and it does such an amazing job. I love how my skin looks when I use this!! I apply 3-4 drops in the morning and night after applying the toner. Clay masks. I use the charcoal mask more often than this, but this is also a great option to clean out clogged pores! Collagen peptides. I’ve been using this for a while, but I do really feel like it helps my skin! I take it a few times a week… not daily, but everyone is different. A free charcoal bar and two collagen peptide sticks with minimum purchase of $125 (before tax & shipping) here. Healing my skin is a journey that I’m still on. Like I said, the skin is the last thing to heal and it can be extremely volatile. Regardless, I’m so happy with my recent results, and I look forward to sharing more tips! Do you struggle with acne and found something that works for you? Let me know in the comments!! I know the struggles of writers block. Of sitting down in from of the computer knowing that your heart is calling you to share itself with the world, but your brain just isn’t firing. You have no idea what to write about, or when to write it. You see others sending out newsletters filled with several posts a week and wonder, “How the heck do they get it done?! Where do all of those ideas come from?”. That was me a few years ago… before I started planning out my content. When I first started blogging, I was working full time, consulting part time, planning a wedding, and was going back to school to become an NTP… not exactly chill. Regardless of how busy I was, I knew that blogging was what I wanted to do, so I made time for it. The problem was that time was scattered all over the place. It wasn’t pre-planned, it wasn’t organized, and it showed in my content. Fast forward two and a half years later, and I almost make as much from my blog as I did from my full-time job. There are a lot of layers within that, but planning out my blog content ahead of time has completely transformed the way I blog. First, How Do You Know What the Heck To Write? This is always the first priority. Does your content even make sense for the season that it’s in? Are you writing about ice-cream in the winter or soup in the summer? Keep an eye on major holidays and back your content up at least 2-3 weeks ahead of time. You can’t post a Christmas recipe on December 23rd and expect it to go viral. You need to give it enough time to get out there, get social shares, and give time for people to plan. For example, I posted my cranberry turkey poppers which were a Thanksgiving recipe on November 5th. That gave it enough time to get around 15K repins throughout the holiday season, rather than posting it the week of Thanksgiving. What Questions Are People Asking You? Answer Them In Blog Posts! As someone with Hashimoto’s disease, I get tons of questions about it. One specific question was about thyroid medication. Everyone wanted to know about thyroid medication! Rather than typing out the same email 50 times, and making my readers do way too much work to find answers, I turned it into a blog post. Now, I can just forward it along, or readers can find it in my blog archives. Whenever I feel stumped on what to write about, I go through my inbox and look for patterns of what everyone is asking. I almost always have ideas after that! This is a bit more sophisticated, and the next level of the previous step. It requires going beyond just what people are asking you, and looking at what they’re asking Google. One of my favorite tools to get into this is just Google autocomplete! Type in something like “instant pot recipes” and you’ll see at the bottom of the page the suggested terms that relate to what you searched, such as “paleo instant pot recipes”, “pot roast instant pot recipes”, etc. This is a really easy way to get some ideas about what people are searching. Another helpful tool is called Google Keyword Planner, which I got very familiar with working professionally with Google AdWords. This helps you see search volume for certain terms. You can also do this with more expensive, sophisticated tools like SEM rush, or Moz. As someone with a digital marketing background, I got a bit more training in this than most do, and I’m about to go to a 3 day conference on it in March again, so don’t overwhelm yourself with this step all at once. What’s Trending? How Can You Put Your Own Spin On It? Look around… what is everyone in your nice talking about? Turmeric? Collagen? Meal Prep? Whole30? In my niche of holistic wellness, it’s all of the above! I always keep my eyes open for hot topics and think of how I can put my own spin on them. This is the single most important piece of the puzzle! Keep a master calendar that keeps you on track for at least a month ahead. I plan up to 6 months ahead at a time, but you want to be able to plan enough to make sure that you’re staying ahead of holidays, and have time to squeeze in last minute write ins. For my content calendar, I just use google sheets! It’s free, and it’s easy to customize. You can also use something like excel, but I love being able to access my calendar from my phone or computer since it’s stored on the cloud. I keep separate sheets for the different seasons and have one column with the dates, and another with the corresponding post titles. Easy to follow, and easy to plan! Now that you’ve planned your posts, you have to actually get it done. You have to go shopping for supplies, take photos, write, edit, and promote it. I keep detailed to do lists to make sure that all of my content planning stays organized and on track. However, it’s not all about making a to-do list the day of. Rather, writing out the steps that you need to do in advance to make a post happen. My favorite tool that I’ve been using for year for this is my Day Designer! It’s a paper planner that has pages day by day to make space for hourly appointments, and daily to do lists! So, let’s say that I plan to post a muffin recipe on March 26th. I write in Day Designer to do list to shop for ingredients on March 11th, take photos on March 12th, and write and edit photos on March 15th. That way, I plan for each step to make sure it all gets done, and that it gets done ahead of time! I’m on my fourth Day Designer, and it’s by far my favorite tool for staying organized and planning ahead. I hope these tips were helpful! Let me know if the comments if you have any tips for planning content that you love. If you’ve read my blog for a while and watch my Instagram stories, you’ll know that I’m happily married to a wonderful man who supports me, inspires me, and grows with me everyday. However, he is not Paleo or AIP… at all. When I met Daniel over 4 years ago, he was surviving off of prepackaged hardboiled eggs, spaghetti, frozen lasagna and all of your typical bachelor food. When we got married, it was an adjustment to learn how to live a balanced life for both of us being on such different diets. How do you like with a non-paleo or AIP spouse when you’re so committed to your own diet? I want to point out that my husband still values healthy food. He’s happy when I feed him vegetables and healthier treats… but that doesn’t mean that he also doesn’t want to eat nachos and pizza! He comes from a family with fairly minimal health problems and has he just does’t notice any negative effects of eating junk food every once and while. So, how do we balance spending time together, eating out, and eating at home on different diets? When Daniel and I first started dating, I was mostly gluten free, and 100% nightshade free. I really explained to him why it mattered. I told him what gluten and nightshades did to my body, where you could find it, and how it would impact my mood and health negatively if I ate any. Then, when I went grain free and AIP, I actually asked him to read Omnivores Dilema with me that discusses corn and soy in great detail to allow him to get a solid understanding of why I was cutting them out. Yes, it took some time for him to really understand. Yes, we had some disagreements on some details. But at the end of the day, love requires wanting what’s best for your partner. After educating my husband on why it was important for my health and wellbeing, he was much more on board with supporting me and advocating me. One of the biggest misconceptions that I hear is that in order to be supportive of someone, you have to do the same diet they’re doing 100%. That’s not necessarily the case. Don’t pressure your spouse or significant other into compliance if it just doesn’t work. Ask for support in other ways! My husband still shows support by trying my compliant recipes, making himself dinner sometimes when I don’t want to handle certain ingredients that he wants, and advocating for me in social situations. He’s always the first one to speak up if someone is trying to convince me to eat nightshades, or if they don’t understand my requests. My husband and I have clear rules of what can and cannot come into the house. For example, dairy isn’t detrimental to my health, so he still eats tons of cheese. However, I just ask him to be thorough with cleaning up after using cheese. Where as, nightshades are much more an issue for me, and these rarely come into the house. Daniel knows what’s okay for me to have around, and what isn’t, and I’ve educated on how to handle certain cross contamination risks like double dipping in sauces, washing silverware thoroughly, and so forth. That doesn’t mean that my husband is nightshade free or gluten free. He still enjoys these foods while eating out or on rare occasions, but setting the ground rules for eliminating cross contamination risks saves a lot of headaches and arguments in the future. Just because your significant other isn’t paleo or AIP doesn’t mean that they still can’t enjoy compliant meals! My husband and I have several favorites that we share. Bacon ranch chicken poppers. Who doesn’t love those flavors? Veggie nuggets. My husband loves these! Egg roll in a bowl. My husband and I both love this! One of my favorite strategies for sharing meals is the layering method. Essentially, you start with a basic meal that’s compliant for your diet, and layer on extras that your significant other will enjoy. For example, making my Instant Pot Chili and adding on good quality chips and cheese for my husband. My husband and I do this often with a myriad of different meals, and we’re always happy with the outcome! Daniel may not be paleo or AIP, but that doesn’t mean that he has to eat junk! Regardless of what you spouse chooses to eat, I still always advocate for getting better quality versions to ensure that everyone stays healthy. Though going out to dinner together is fun, it’s not always necessary for spending time together! Daniel and I focus on spending time together in more ways than just eating out. I know that relationships are hard in a myriad of different capacities, but I hope these tips helped on the food front!